Deployment of water cannon vehicles to break up non-permitted demonstrations or against radicals is still essential for the police. At least this measure avoids that people are injured or even killed during those conflicts. 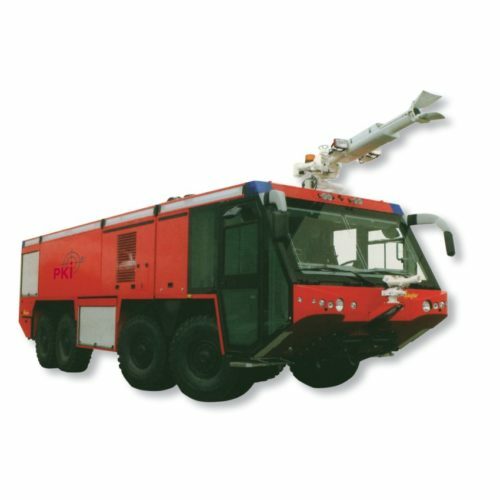 The windows as well as front and back lights of the PKI water cannon vehicle are protected with steel bars against stone’s throw. Door grips are designed in a way that there is no possibility to cling to them. By means of a covered loudspeaker of 75W power clear announcement can be made. The driver’s cabin offers space for 6 persons. Windows are made of bullet-proof glass. The tank has a capacity of 9.000 litres and the water gun shoots over a distance of max. 65 m 15 bar pressure. Various: we can offer different sizes. All control devices for pressure, temperature, power are installed.